As you know we aren’t one to say no to a drink every now and then, so we’re pleased to announce that Andy Heggs, of Hop on the Bike and Drumbeat, is selling an ale in aid of Forever Manchester. You can whet your whistle with some Marmalade and Assam Tea IPA on Sunday 19th April at 1pm. The event will be held at The Font Bar on New Wakefield St in Manchester. Whilst your doing that, you’ll be raising funds for Forever Manchester. Those funds will then be given out across the whole of Greater Manchester to community groups and projects. There’s no ticket/admission price for coming down to the event, but it would be appreciated if you came along with a few quid to raise funds for this very worthy cause. 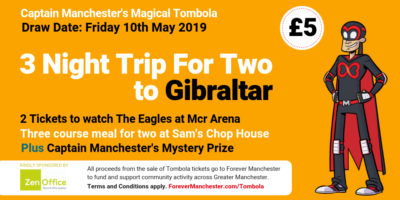 The beer will be sensibly priced but it won’t last long, so there will be plenty of opportunity to part with your hard earned cash for the chance to win some of those great prizes, or just by making a donation to Forever Manchester. On hand to chat will be one half of Northern Alchemy, Andy Aitchison who’ll be generously giving up his weekend and trekking down from Newcastle to join us for the afternoon to tell you all about the beer and the magic that happens in their container brewery in the heart of the Ouseburn Valley. There will be an auction and raffle on during the event as well, so make sure you take a few quid. They are pretty impressive prizes. Register your interest on their website now.